Published on January 11, 2012 in General T&T and Passed on. 15 Comments Tags: African, JaJah Onilu. If we say he was/is a great one yuh might say is ah cliche dat we use every time a popular artiste pass on. JaJah Oga Onilu is truly a great one. Artiste and cultural activist, teacher, craftsman, instrument designer/maker, jeweller…and dat eh all. JaJah was a singer, songwriter/composer, a record producer. 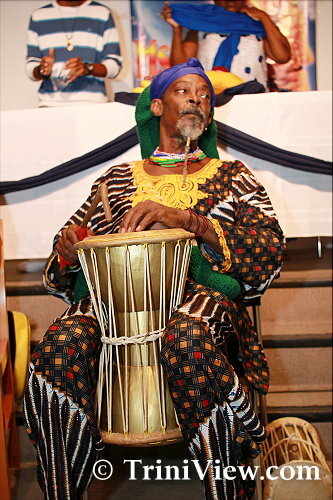 Above all JaJah Oga Onilu was a MASTER DRUMMER and PERCUSSION SCIENTIST. Yes he was all dem tings and good at dem; good to de extreme. And so he did like he self and he all right to. Many communities will claim Onilu as their own and dey right becuz he give he self to every body, every where, every block, every yard. Laventille though and East Dry River in particular was home -Basilon Street Youth Centre wey he had his workshop for years…before he children born, before the Caura project. Picadilly Street wey he had his retail store in Mango Rose in spite of de NHA(now HDC). And before all ah dat, Jackson Hill wey de power and percussive possibilities roll out in de story of de MAU MAU… wid Vennie and Pops and de rest ah dem. 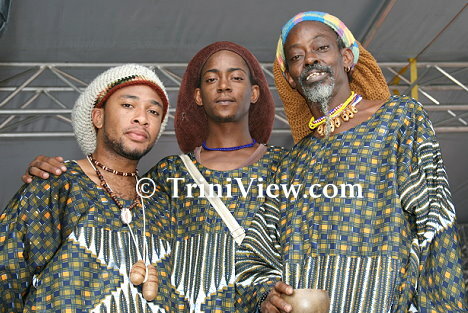 And JaJah wid Vennie and dem would bring dis experience to build a foundation wid Andre Tanker. Yes, there was a time when there was a drum culture in our communities…not a gun culture, and JaJah was one of de leaders at de centre of dat movement… proud and powerful… African King. JaJah Oga Onilu consciously and self-righteously appointed himself de title Master Drummer and continued de work of de great Andrew Beddoe…sharing his percussive intelligence wid ah mystical flair dat went beyond his youthful years… building de foundation for a DRUM CULTURE. JaJah Oga Onilu was always a man who live like he was here already and so he was always one step ahead on dis journey. When from early we was sitting on de cold concrete in Quarry Street, East Dry River or playing ball below de caimate tree, Onilu was walking wid he talking drum… everywhere. And so he coulda show off on de block… bcuz he had de Mau Mau and dem was one of de top drumming organisations in de Caribbean, yes. And how he playing wid de great Astor Johnson Dance theatre… and how he working wid Lancelot Layne… and how he working wid Cheryl Byron … and dat he was a professional. Then he went North America on tour wid Astor and out dey he see The Last Poets and realise dat we was done doing de same ting home in Quarry Street. He come home and tell we dat Network had to get serious and get we self …professional. He start to work wid we drummers Mickee and Black Pearl… he bring a child star named Wayne Haynes (Bongo Waynee) and say dis child hands faster than his own and he want Network to take care of him. He start to drill Brother ShortMan. It was a new day in East Dry River. A triangle of young leaders: JaJah, ShortMan and Resistance. Music, madness, magic and community work… it was a Rapso attitude and we was ready for de world. It was JaJah dat carry me and ShortMan in de studio for de first time in Sea Lots. It was he and Ron Reid who would produce we first recording Dancing Shoes and Squatters Chant. Yes, de new sound of de Network Riddum Band… 1980/81. Some years before dat, JaJah turn down ah offer to tour wid Bob Marley and de Wailers…he say dey couldn’t pay him to leave home. Onilu would give many years to build de Andre Tanker legacy. Onilu would give many years to support Ella Andall on her journey…and dat was a combination, a living testimony to Africa in dis part of de world and a foundation to de building of dis Trini culture. It was JaJah who would work wid Lancelot Kebu Layne to organise de first procession to commemorate Emancipation in these times… One grey morning, 6 o’clock, Basilon Street Community centre, one small Mazda van and JaJah lookin’ for de drummers to support him. It was JaJah who would bring de energy and excitement to bear on de Peoples Mall as we established de Uprising Culture Shop to be de Ministry of Rootical Culture and de Calypso headquarters at de time…Karega can testify. It was JaJah who would seize de time and seize de space up at de savannah to establish a real craft market and cultural arena in de middle ah de Carnival. Onilu dey wid he Bamboolin and he rain maker and he berimbow and he bowlee drum and thru it all he stood tall, he walk tall, he did not bend nor bow down to de oppressor; did not surrender to de colonial order. Yes, JaJAh Oga Onilu – King Master Drummer and Percussion Scientist – walked wid de glory of Kings. 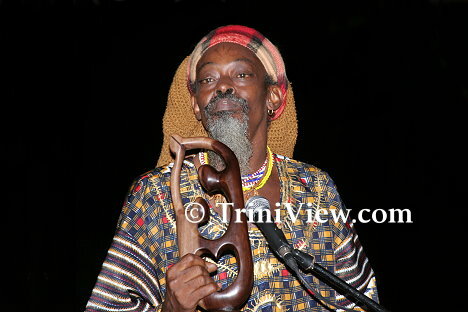 He take years to make dat pair of drums and then added a next one to it right dey in Quarry Street – #9 to be exact. And is Brother Shortman (Everad Romany) who do de carvings on dem because Onilu wanted monuments out of his musical instruments for he had seen it all in a vision. Talk to de drum and de drum a talk back to you. Fantastic piece Bro Resistance ! You have done King JaJah a great service through your writings . JaJah’s work is done and it will live forever . Thank You Master Drummer. Thank you Brother Resistance for this heartfelt expression on this true Trinidadian and African treasure. My condolences to JaJah family and Loved Ones. May Jah, Ras Ta Fari Bless and Keep you JaJah. Enjoy d jam with Bob, Myles and Jimi and especially give my Love and Regards to Andre. and seeing JaJah and the whole Network family from its embryo stage,May Jah bring support and deserving blessings to his famil. May his sons continue in their fathers tradition. Long live the culture of AFRICA. Yes Brother Resistance for making the masses know bout the man . Walk along side the man at times ,playing with you Brothers. My condolences to JaJah family . Great tribute to King Master Drummer/Inventor JaJah Oga Onilu. Thank you Bro. Resistance. I am from Toronto, Canada. I had the great pleasure of performing at Muhtadi’s International Drum Festival in Tobago in 2005 with Samba Squad where I saw and heard the great JaJah Onilu perform with his sons. Needless to say, my band mates and I we were mesmerized by his incredible talent not only as a percussionist but also as a craftsman. His instruments were so unusual and beautiful. Watching him perform was one of my all time favourite musical experiences. May you rest in peace JaJah. As I mourn the passing of my former Moulton Hall Methodist Primary School colleague Ja Jah Oga Onilu (Carl Mulligan) last weekend, I ponder on riddims (rhythms) and I am reminded of the dramatic and contrasting changes in calypso music these past four decades. The photo of JaJah that accompanies this article belongs to TriniView.com. ah Jah! I couldn’t believe the call I got this morning. You were always an inspiration to everyone. I have carried the memories of our times back in the 80’s with Andre Tanker and the Mau Mau Drummers. What an experience it was. I am far away, but those memories have helped me and brought me to who I am today. I was the only woman in the group with four of you guys. I will always cherish the time we spent practicing and performing. I will always remember the words of wisdom. I am blessed to be a part of your time, and your gift to society. Even though, I am so far away, you continue to be a part of my cycle. I am so shocked! Love! Once again, a Great Master has left us, without receiving the honour due to him! He has left a great legacy, which his sons Modupe Folasade and Baba Ayinde are well prepared to carry on. Fare thee well King JaJah. You will always be remembered. Jajah Onilu, was one the greatest musicians of both his time and my time since I am a very young person. I am one of his last students before his passing. He embedded a wide range of music and understanding of music to me through the drums and percussion instruments. He always spoke of the inner teacher and how music is a natural expression of our people. It is part of who we, he said. Music expresses our good time, bad time, what we observed around, so much that he said that the first instrument is in fact nature. The wind whistling through the trees, the frog, the birds and the water flowing. Onilu is one with nature and the spiritual realm even before his passing. He always listens to the inner teach and followed nature which is the inspiration of his instruments. If you don’t believe me check his sons Baba and Modupe Onilu in Coura. Every one of his instruments sounds like a character of nature. It was truly an honour to have him as my teacher and advisor. He will truly be missed. Oh, I have to say one more thing, please stop waiting until someone dies to honour them. It makes no sense. I truly hope that his sons would be honoured and given the support need to not only carry on the legacy, but also to lift the name of our great country of Trinidad and Tobago before they leave their earthly forms. This was one of Jajah missions. That why he stayed here and didn’t leave with Bob Marly. Please people, Ministers and activist of the art forms. Please. My heartfelt condolences to the family and friends of Jajah Onilu on the sudden passing of this phenomenal musician, compassionate man, and great spiritual teacher. My connection with Jajah was recent and all too brief, but has left a lasting impression on me and has shaped the way I see the world now. I feel blessed that I was fortunate enough to know Jajah. May his spirit and values live on.